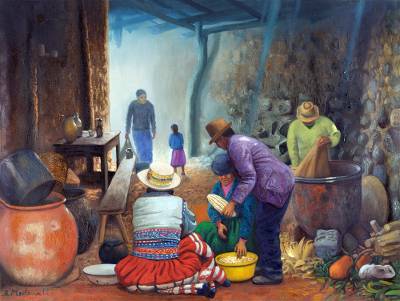 Peruvian Realist Painting, "Countryside Kitchen"
Cooking becomes a communal endeavor in the Andes, with everyone assigned a specific task. A man and woman grain corn together while others cook, chop or bring firewood. "I love painting scenes from the countryside such as this kitchen in Chivay," confides Peruvian artist Alcides Molina. "The women wear the most amazing and colorful garments, which they embroider by hand." Tilted "Cocina campestre" in Spanish.